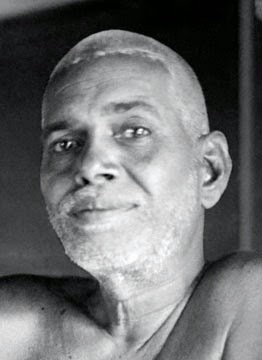 RAMANA HRIDAYAM - A blog on the teachings of Ramana Maharshi: WHO IS RAMANA? Someone wrote,"Ramana was an ordinary human being. Why not take him at his word? He was a mountain of common sense in a sea of superstition...."
I answered: To call him equal is a judgement also. How do we know? Better than all conclusions is to look at facts. An ordinary human being is usually unable to radiate such a power of peace that was felt by animals and human beings alike so that they forgot their former state of mind and felt at home. Monkeys came and were tame, asking him to arbitrate their conflicts. Human beings came and some received enlightenment, also a spark that average, ordinary beings don't radiate. So we must be careful not to put our conclusions and make him according to our likings. Any image of God or guru is self-fabricated. Some belittle the great ones to express their desire to be equal to them. Others put them on an imagined high pedestal to feel great with the idea to have a great guru. Best is to follow Bhagavan's teachings to go to the root of mind and realize TRUTH. That was the only thing he asked us to do. The Old Testament says, 'Don't create an image of God'. That is advaitic teaching. All images, big or small are only ego images. That is why Africans venerate black gods. On the other hand: images have their place. The can be a door to the formless. Who are we to judge others? A devotee named Amritanatha Yati wrote on a paper a Malayalam verse imploring Bhagavan to say whether he was Hari (Vishnu) or Sivaguru (Subrahmanya) or Yativara (Siva) or Vararuchi. Bhagavan wrote his reply in the same Malayalam metre on the same paper. A translation of it is given below.